Five Quaker organisations from Europe and the United States have asked governments to say ‘no’ to the Transatlantic Trade and Investment Partnership (TTIP), the controversial ‘mega’ trade deal being negotiated between the European Union and the United States. American Friends Service Committee, Friends Committee on National Legislation, Quaker Council for European Affairs, Quaker United Nations Office and Quaker Peace & Social Witness, have sent a statement to government representatives and trade officials in the European Union and United States. They said that TTIP negotiations are prioritising the prospect of short-term economic gain over the longer-term factors necessary to human wellbeing and protection of the Earth. TTIP is set to include a so-called Investor-State Dispute Settlement mechanism or Investment Court System, under which foreign companies could sue governments for introducing social, environmental, health or other legislation believed to threaten profitability. The Quakers assert that these mechanisms hand too much power to large companies, making them “fundamentally antidemocratic in nature and therefore unacceptable”. The Quakers say that TTIP will almost certainly hamper international commitments to tackle climate change and global poverty, including the recently agreed Paris Agreement on Climate change and the UN Sustainable Development Goals. Quakers are calling for a fundamental rethink of global trade rules and for future trade deals to be aligned with the demands of these commitments. The history of the European Union shows how trade can bring huge benefits,” said Helen Drewery, General Secretary of Quaker Peace & Social Witness, a sector of Quakers in Britain. “However, the desire to increase trade must not be allowed to override other important social and environmental concerns. Our faith as Quakers impels us to seek economic relationships that reflect our fundamental human equality”. Quakers are known formally as the Religious Society of Friends. Their commitment to equality, justice, peace, simplicity and truth challenges them to seek positive social and legislative change. Trade for well-being, not just for profit: A shared Quaker statement on TTIP and free trade agreements can be read in full at www.qcea.org/trade. Quaker Peace & Social Witness works with and on behalf of British Quakers to turn faith into action. It is a department of Quakers in Britain, whose representative body discussed TTIP in July and December 2015 concluding that it had “deep concerns about the impact of the proposed agreement”. The Quaker Council for European Affairs brings a Quaker vision of just relationships to the European Union and the Council of Europe. 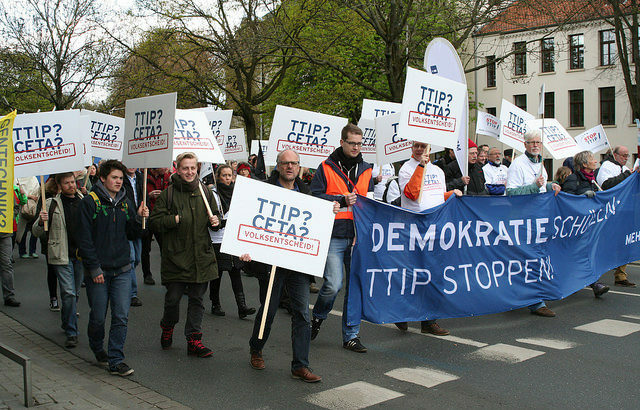 QCEA has worked on trade issues and TTIP since 2013, advocating for trade deals to prioritise the well-being of people and planet, above profit. The Friends Committee on National Legislation is the nonpartisan Quaker lobby in the public interest, and works with the United States Congress to change government policies that perpetuate all forms of injustice. FCNL has worked within interfaith and multi-sectoral coalitions to highlight to elected officials the major environmental, human rights, and labour concerns with the Transpacific Partnership (TPP), TTIP, and other free trade agreements. The American Friends Service Committee is a Quaker organisation that promotes lasting peace with justice, as a practical expression of faith in action. This work has included decades of grassroots education and advocacy for trade policies that place human dignity, economic justice, and environmental sustainability the heart of the global economy. The Quaker United Nations Office works with the UN, multilateral organisations, government delegations, and non-governmental organisations, to address the interconnections between trade, investment, intellectual property rules and how they relate to poverty, hunger and food insecurity. QUNO engages with all stakeholders from small-scale farmers to trade negotiators, providing safe spaces to explore how the food system could be made to work for the whole of the world’s population. 2016, Economic Justice, News, Sustainability, Trade. permalink.